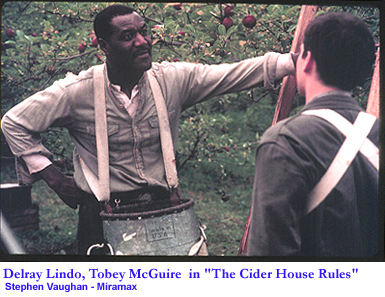 There is much to like about "The Cider House Rules," starting with the simple phenomenon that Hollywood did not entirely screw up the job of making a film of the John Irving novel. No doubt that's because it was a non-Hollywood director, Lasse Hallström, at the helm, and because Irving himself wrote the screenplay. 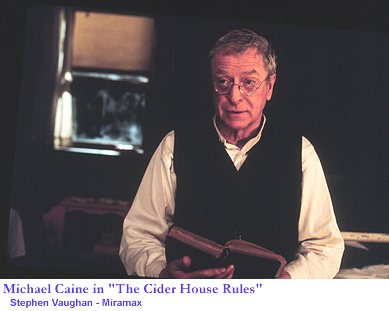 Of course, a major novel can simply not squeeze into a feature film's time limit of three hours or less, so much of the meat of the great novel is missing from the movie "The Cider House Rules," but enough of its great spirit and moving story are on the screen to touch the heart. It is an epic, in the classic sense, with the old hero -- Dr. Wilbur Larch, pediatrician and illicit abortionist who runs an orphanage -- and a young hero -- Homer Wells, an orphan Larch has trained to replace him, but who would rather take off on his personal odyssey, to see the ocean, and to experience romance. Larch, played with his usual charm and first Yankee accent by Michael Caine, believes in being of service. He served as a field doctor in World War I, and by the time we meet him in this film, in the late 1930s and early 1940s, he runs an orphanage, where he gives troubled mothers "abortions or orphans." The film only barely explores his motivation, which is a bit of a shame because it underplays what a hero Larch was for his time. In these post-"Roe vs. Wade" times when a woman's right to choose is the law of the land, it's hard to imagine what horrors were commonplace for American women who needed abortions but could not legally receive them. The film leaves it to Homer -- nicely played by Tobey Maguire -- to act out the revelation of why a woman sometimes needs an abortion more than she needs either her own child, or to create another orphan. The film opens with sad, pregnant women getting off the train at St. Cloud's, Maine, where they are briefly assisted by a station master played -- at long camera distance -- by Irving himself. They trudge through the snow to the orphanage, where some will leave orphans behind ... and some will not. The orphan children in this film are all completely adorable and charming, which is one of the reasons why this is a fun movie. The kids rough-house in the snow and listen to Homer read Dickens at night, before Dr. Larch turns off the lights while intoning to the boys, "Goodnight, you princes of Maine, you kings of New England!" We meet Fuzzy, for whom Larch invents a breathing machine, and the boy who is sure he is the best one. Larch has trained Homer to be a doctor, despite Homer never having attended high school, much less medical school, and wants Homer to take over his service to troubled mothers some day. But Homer has been disturbed by what he sees in the burn bucket after the abortions, and while he will deliver babies and assist with the recovering mothers or non-mothers, refuses to perform abortions. One day a shiny car delivers the beautiful Candy Kendall and her beau, the handsome Wally Worthington, to the orphanage, where Candy does not leave a new orphan behind. Homer asks Candy and Wally for a ride. Homer is of service -- honoring Larch's teaching -- but merely in giving comforting advice to Candy, and by becoming an apple orchardist and a lobster fisherman. Larch, meanwhile, even from afar, continues his scheming to get Homer to take over for him someday. Wally goes off to war -- World War II -- and is eventually reported missing in battle. Candy and Homer come to love each other. While working in the orchards, Homer meets the foreman, Mr. Rose, played with considerable strength and menace by Delroy Lindo. Mr. Rose demonstrates why nobody wants to "get into the knife business" with him by slicing up the clothes of a worker with a bad attitude. And, Homer meets Rose Rose, daughter of Mr. Rose, played by Erykah Badu. She is tough and beautiful, with the kind of gritty awareness that comes of having lived a hard life. The Rose family will play a part in Homer's transition from young man to mature hero in Irving's epic. Those who haven't read the book can enjoy it if they are willing. 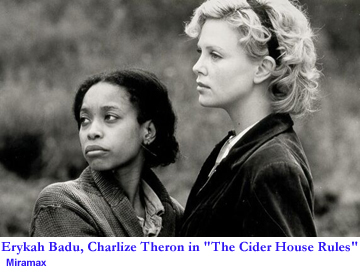 For those who have read the book, you will note that Candy in this film, while beautifully and charmingly played by Charlize Theron, doesn't have the depth and the motivation of the Candy of the novel. In this movie, she could be viewed merely as a shallow and needy person. Go read the novel to find a more admirable Candy. The movie won a best supporting actor Oscar for Caine and a screenplay Oscar for Irving. It was nominated for five other Oscars. It's a beautiful film. See it on the big screen if you can. If you miss it in the theater, it will be a fine rental. 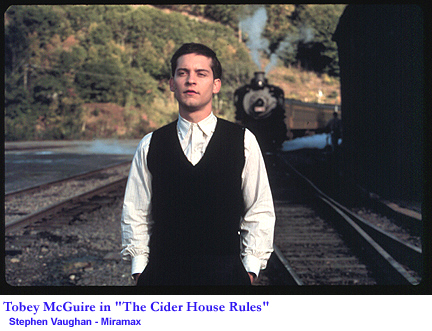 See cast, credit and other details about "The Cider House Rules" at Internet Movie Data Base.